This month’s Avid Baker’s choice was something I was looking forward to. I love heavy; dense cakes and pounds cakes are the type of cakes that fit this bill. Plus is has been a while since a pound has been made around these parts. 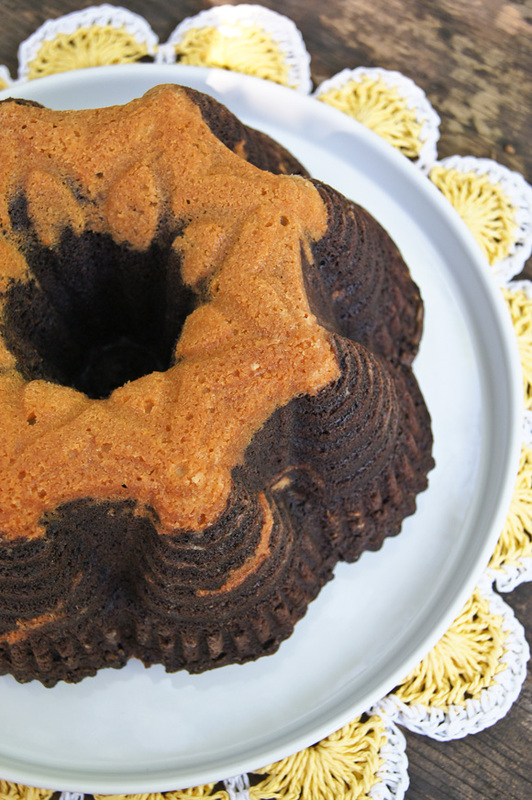 Would you believe that I have never, ever made a chocolate pound cake? 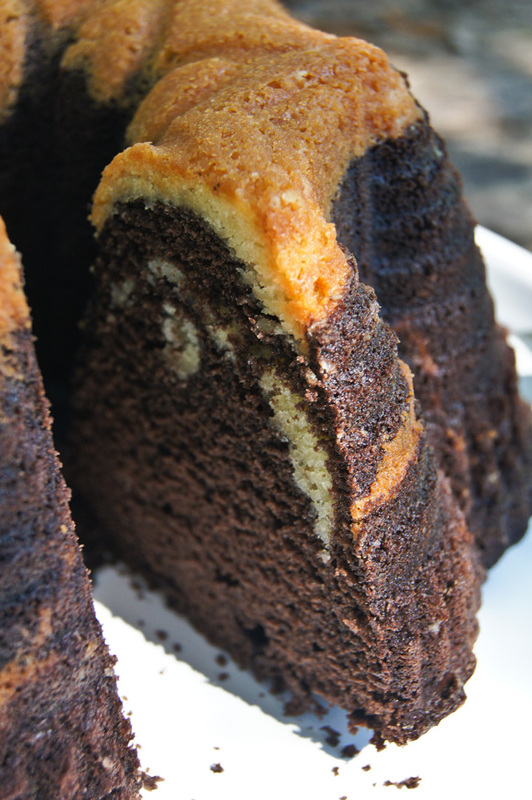 I have made Vanilla, Marble, Cradle, Mocha-Walnut Marbled, but never a whole chocolate pound cake. And this one has almonds. Which is one of my favorite nuts. How I have gone on and not fix that little blimp in my baking life, I never know. But, it was time to put it on my list. And the cake was promptly written in the cooking/baking calendar for the weekend. What this cake has going for it: Its easy. I bet you have most if not all the ingredients in your pantry and refrigerator right now and if you want to be completely lazy, you can skip the fancy Frangipane and just make it all chocolate. Very versatile if you ask me. As you can see, I went fancy and used one of my decorative pans – which gave me an “oh-oh” moment after I finished filling it with the yummy batter (Yes, I eat raw batter). The recipe called for a 10 by 3 bundt pan and mine was just that a total 10x3. Nevertheless, the batter came all the way to the top of the pan. See? a total “oh, oh” moment. I debated. Should I take some out? Should I just go for it? I chose the road less travelled. Translation – I was too lazy to scoop out some batter to play it safe, and left it like that. And then I became one of those bakers that just sat and watched thru the oven glass door the cake rise and hoped and prayed over and over again for it not to spill all over the place. I was NOT looking forward to cleaning up my oven over the weekend. It worked, because it did not spill over. The results were spot on. The cake was moist and very chocolatey and the frangipane was rich in almond flavor. Is there room for improvement? Yes, I believe there is and for the next time I would double the frangipane batter, because I truly believe that it needs more ripples – it’s not enough, I would have loved for the cake to have more almond layers between all the strong chocolate goodness. But, another good one from Flo Braker. If you would like to see the other ABC Baker results, head over here and be click happy and leave some comment love.